Examples, solutions, videos, worksheets, and activities to help Geometry students learn about exterior angles of polygons. The following diagram shows that the sum of the exterior angles of polygons is 360 degrees. 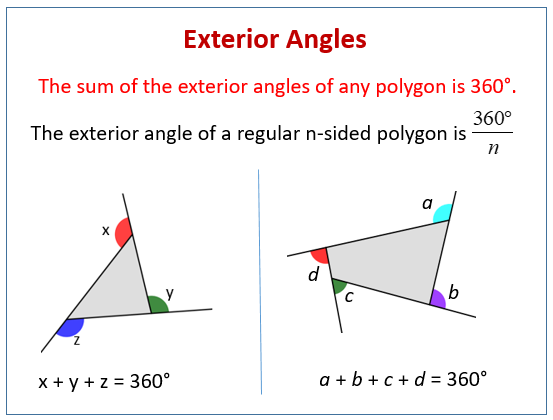 Scroll down the page for more examples and solutions for the exterior angles of polygons. Students learn the definition of a regular polygon, as well as the following formulas related to regular polygons. The measure of each exterior angle of a regular polygon is 360/n degrees.